2018 has been a year of many firsts for me: first time producing my (first) short film, first time directing that same short film, first time participating in Austin Film Festival’s First Three Pages Live at ColdTowne Theater (and later Pitch Day, then Pitch Finale Party! ), and first time shamelessly promoting the hell out of my (first) crowdfunding campaign for my dark comedy short film, An Uncomfortable Woman (not autobiographical although the title can lead you to believe so). I was lucky enough to have a very early version of An Uncomfortable Woman script selected for First Three Pages Live in June, where I was able to witness the words I had written (with co-writer Sam Stepp) read aloud by actors on the same stage I perform my all-women late night show, That Time of the Month (shameless plug #2). I was even luckier to have our script chosen as the audience winner, which as someone who never wins anything (I was elected Secretary of National Honor Society in high school only because I ran uncontested), I was shocked. And as a comedian who thrives on external validation from others, I was delighted. Since then, the script has evolved significantly during the rewrite process — the count level of WriterDuet drafts I’ve saved out is comparable to whatever number they’re on for Now That’s What I Call Music! compilation albums. But what’s remained relatively the same (after a few tweaks based on audience reaction) are those first three pages, thanks to the real-time feedback resulting from First Three Pages Live. And now we’re getting ready to make the damn thing, thanks to the support of friends, family, lovers, and haters. 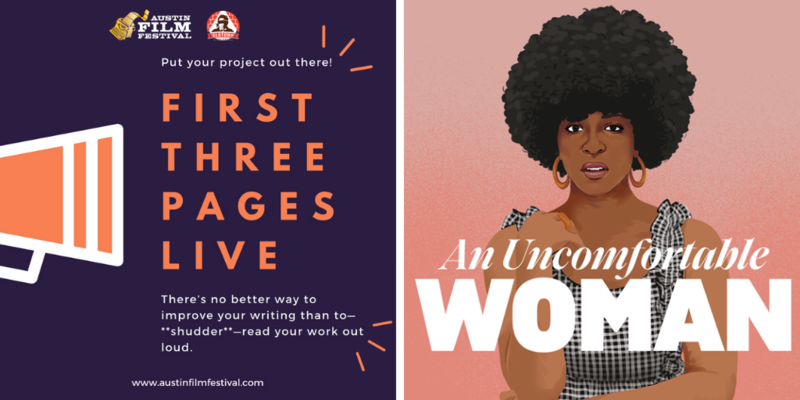 We’ve launched an Indiegogo campaign, where the funds will go towards paying our all-women and POC crew and cast (we’ve applied our own inclusion rider to our production!). In exchange for donating, you can get some cool-as-hell prizes from local women-owned businesses, women artists, and women professionals. 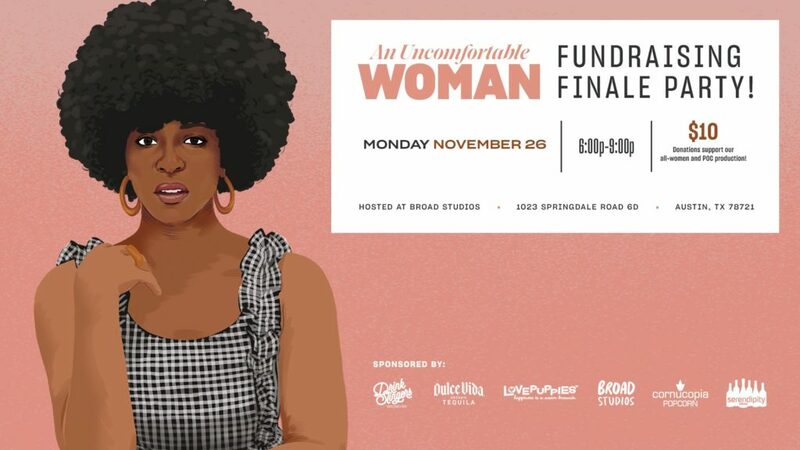 Austin-based folks are invited to come celebrate the end of the campaign and the week leading up to our shoot during An Uncomfortable Woman Fundraising Finale Party (shameless plug #3) at women-run artist collective Broad Studios from 6-9pm! We’ll have free snacks and drinks from lovely sponsors Cornucopia Popcorn, LovePuppies Brownies, Dulce Vida Tequila, Serendipity Wines, Thirsty Planet, and DrinkSlingers, plus an all-women comedy lineup. You can also pick up your Indiegogo prizes in person or purchase remaining prizes, with funds going directly to the film.